My sewing machine has been humming this week in between weeding sessions in the garden and the general duties of running a household! 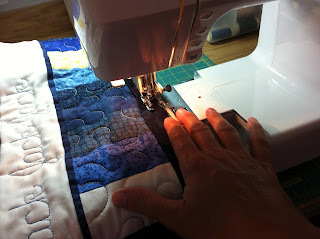 A few weeks ago, I sent a couple quilts off to my favourite long-arm quilter, Marie of Blueberry Hill Quilts in Chestermere, Alberta and I picked them up from her on Monday. There's just one more quilt for this order - a baby quilt for the new baby expected this fall, and that will be next up on my to-do list! Those are nice quilts, and I just love quilting words. They give a big bang for the buck, as most persons, especially quilting muggles, don't know how easy it is to do. Love the words. Do you do it by freemotion quilting? The names were free motion quilted on a long-arm by my friend, Marie. Have fun with all the binding. I love the colours you chose! Are those disappearing nine patches? 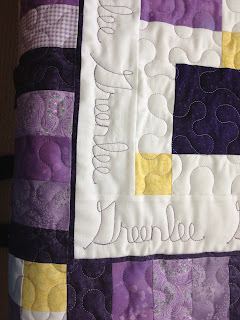 very pretty quilts, and incorporating their names in the quilting was genius! I love when the recipients names are included in the quilting of a quilt. Leaves no doubt who the quilt was intended for! I made a quilt years ago for my mother with the names of all her siblings written around the border. She loved it. She would trace her finger around the names and I just knew she was lost in her memories. These are such pretty quilts. I love the inclusion of the names! Thanks for linking up to WIP Wednesday! Back to the Sewing Machine!